Under the direction of Ryan Abraham, Parks Supervisor, 5 full time employees and 9 seasonal employees maintain 155 acres of green space (including maintenance of the boweries), 7 soccer fields, 3 softball fields, 4 hardball fields and 2 football fields! Along with this, they also maintain the beautiful flowers that can be seen up and down Historic Downtown Main Street, in the Bill of Rights Plaza and many other City facilities. This is a busy group that keeps our parks and fields in pristine condition. People from across the state reserve our boweries, enjoy our parks, and play on our well kept fields! Sponsored by the Arbor Day Foundation, Brigham City is proud to be designated a Tree City USA. Certain steps are required to obtain this designation. They are: establishing a Tree Board, creating a Tree Care Ordinance, setting up a Community Forestry Program with an Annual Budget of at least $2.00 Per Capita and an Arbor Day Observance and Proclamation. City Foresters possess the skills to help you in planting, transplanting, pruning, fertilizing, pest control and an array of other tree care practices. They also offer advice in diagnosing problems, and recommending treatments. If you have questions you may contact the City Forester at (435)734-6615. Brigham City is famous for its tree-lined streets. The majestic sycamore trees along Main Street are considered to be one of the finest examples of successful urban forestry in Utah. 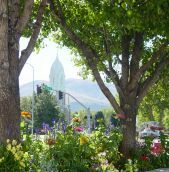 The Shade Tree Commission was established to foster urban forestry in Brigham City. Mayor Olof Zundel and the City Council established the Shade Tree Commission in 1966. The Ordinance states that "The duties of the Shade Tree Commission are advisory to the City Council and shall extend to all policies and phases of tree culture related to trees and shrubs now planted and growing or hereafter to be planted and grown upon any and all of the public streets and places of Brigham City." In 2014 the Commission was then tasked to participate in the Yard of the Month program during the summer months. At that time the name of the Commission was changed to the Urban Beautification Commission. The Commission meets, as needed, on the 2nd Wednesday of the month at 4:00pm. in the Public Works Conference Room located at the Public Works Complex, 980 W. Forest Street. Tree planting guides are available upon request from the Public Works Administrative Offices located at the Public Works Complex, 980 West Forest Street, or you may call in your request to the Public Works Administrative Assistant at (435)734-6615. From time to time, the natural growth of a tree will interfere with City signs or impede the view of an intersection. Trees are trimmed in order of request and by budget ability. Forms are available in the Public Works Complex at 980 W. Forest Street or you may call in your request to the Public Works Administrative Assistant at (435)734-6615.